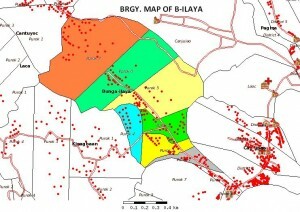 The popular name of the barangay is Bunga Ilaya. It was derive from a fruit-bearing trees called buñga (bettlenut), which grew abundantly in the barangay and Ilaya, which means a place far from the sea. There were about 15 families living originally in the barangay. These families were the Oclarit, the Madera, and the Bajao. Brgy. Bunga Ilaya shall have healthy, educated and God-fearing residents that are willing to work and participate in any civic activities for the welfare and betterment of the Barangay. At the same time , they shall be living in a peaceful and drug free environment spearheaded by an active Barangay council with the support of the LGU, Provincial and National Officials in order to achieve and realize their dreams and aspirations. To put into reality the development plans of Barangay Bunga Ilaya, the people shall work together toward a common goal, w/c is economic stability, w/ the support of the Barangay council, LGU, government and non-government organizations. Moreover, they must foster discipline w/in themselves as the key towards growtn and development of the Barangay in general.